During Thing-a-Day 2009, I promised my six year old granddaughter that I would make her a tiara if she helped me to sort out my bead box… Terrible woman that I am, I have not fulfilled that promise to her up until today!! Well, you know how it is…sometimes life gets in the way of the best intentions. My granddaughter is a real girlie girl. She loves all things pink and sparkly – so predictably she focused on sorting out all the pink pearly beads and all the ‘diamonds’ in my box of beads from broken up jewellery. Nothing in the box is ‘real’ or of any intrinsic value – all the ‘good’ stuff is carefully stored – but I find these plastic and base metal beads have uses in all sorts of art and craft applications. So I was quite happy to use them in practicing the art of tiara making. I have used the silver plated braided wire that I made earlier this month (Day 13) and added a selection of the beads that she sorted out for me. 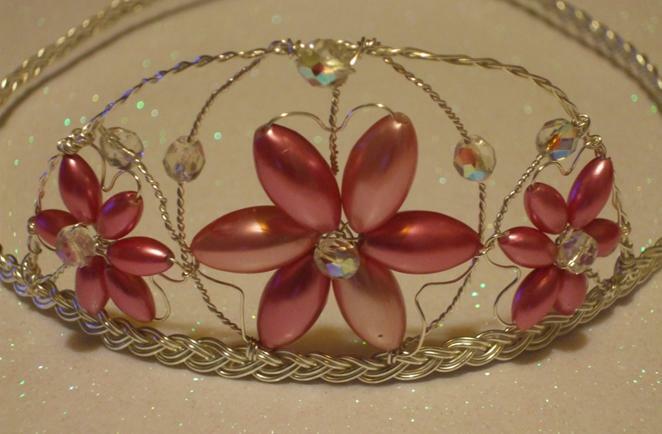 I have spent much of the afternoon grovelling on the floor trying to find all the beads I have dropped and, predictably, my fingers are rather sore but I think I have done a reasonable job in making a tiara fit for a little princess that will see rather more play times than royal occasions! I hope she will like it – and forgive me for taking so long in making it for her!